Welcome to the veterinary Internal Medicine Service. We are committed to providing excellent patient care and client service with the expertise of our board-certified veterinary specialists, staff veterinarians, and our veterinary technicians. Our service is available for evaluations and rechecks each week, Monday through Friday. 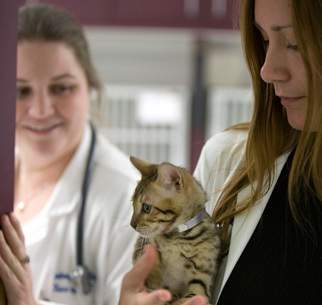 Small Animal Internal Medicine offers state of the art medicine to our veterinary clients and provides an excellent learning environment for students, interns and residents while providing the best possible patient care. It serves as a resource of information for veterinarians throughout the State of Florida and contributes to the discovery of new methods for the diagnosis and treatment of sick dogs and cats. 24-hour Intensive Care Ward for critically ill patients.